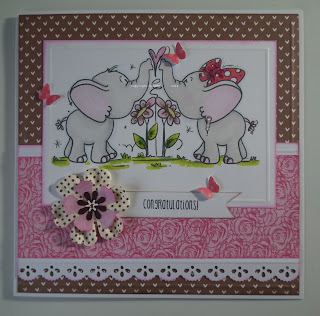 I got a totally gorgeous image this time, from Bugaboo - called, "elephant love." and thought I could use it for an engagement card. The flowers are paper flowers - from Docrafts, I think. The darkest flower was punched. Pink Petticoat (no longer trading) is the source for my sentiment. with a magazine, quite some time ago! I inked the edges of everything on this card...sometimes using brown, sometimes pink. The border has been punched, and the butterflies, too. I used promarkers and spectrum noirs to colour my image.